Time for some serious bonding! This is reunion month, our 25th Anniversary. We’re celebrating on Saturday, September 27 at Corporate HQ — you’ll want to be there! Please remember that Reunion 2014 RSVP’s are due to the treasurer by Friday, September 12th. Reunion 2014 has some very special events scheduled. CEO Alex Molinaroli will give us an update on Johnson Controls. We have certainly seen some changes so far. Learn more about that, direct from Alex. We’ll also take the time to get your input on where you think the society should be going for the next 25 years. To help with that, we’ve expanded the invitation list to include candidate members — mostly current employees of Johnson Controls in the local area with significant years of service. They and their peers are the future of the society. 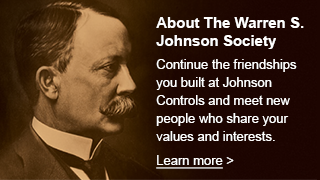 Their needs and vision for an organization like the WSJ Society are critical for planning the continued success of the society. The results of that event will be used to initiate a discussion on WSJSociety.com, enabling input from all members and candidates regardless of location. Let’s get it going at Reunion 2014. Both members and candidate members stand to benefit from the “Ambassadors of Lifelong Engagement” event at Reunion 2014. It’s all about sharing experiences. Those in-career might be wondering just what one does in-retirement, and how to prepare for it. Those in-retirement might be looking for something new or ways to further develop their current interests. “Ambassadors of Lifelong Engagement” is set up to start a process of sharing experiences. Small group discussions are planned on topics that include: Lifelong Learning, Volunteering, Health & Wellness, Work/Start a Business, Crafts & Projects, Sports & Fitness, Financial Planning, and Travel. Along the way, we’ll be asking participants to repeat their story here on WSJSociety.com and share the resources they’ve found of value. We hope to use these to prime the pump for an on-going exchange of experiences and resources to benefit all members, again, regardless of location. After all of that ‘work’ we’ll get together to relax and enjoy each other, dinner, and music at the Italian Conference Center.